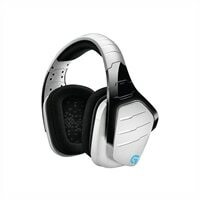 Logitech G933 Artemis Spectrum - Limited Edition - headset - full size - wireless - snowOne headset for all your devices lets you take G933 Artemis Spectrum from your gaming rig to your gaming console and your mobile devices. You can even connect your home theater to the USB-powered wireless mix adapter and listen to TV shows, music, or movies wirelessly without disturbing the people in your home. Patent pending advanced Pro-G audio drivers are made with hybrid mesh materials that provide the audiophile-like performance gaming fans have been demanding. From your favorite music to expansive game soundtracks, the Pro-G drivers deliver both clean and accurate highs as well as a deep rich bass that you would expect from premium headphones. Experience incredible 7.1 surround sound with Dolbyreg; or DTS Headphone: X Surround Sound, creating lifelike in-game special awareness, allowing you to clearly hear enemies sneaking around or special ability cues. One headset for all your devices lets you take G933 Artemis Spectrum from your gaming rig to your gaming console and your mobile devices. You can even connect your home theater to the USB-powered wireless mix adapter and listen to TV shows, music, or movies wirelessly without disturbing the people in your home.